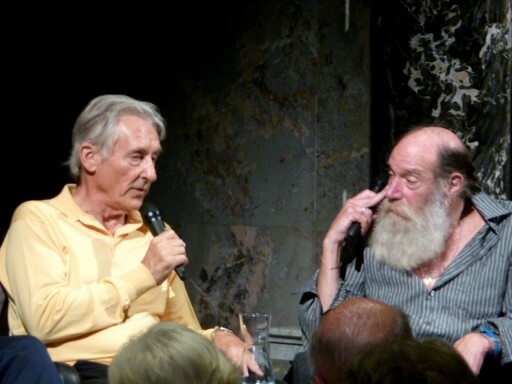 The Artist talk between the curator Jasper Sharp and two great American artists Ed Ruscha and Lawrence Weiner on the ocasion of their exhibitions in Vienna which was held last night in the KHM (Vienna’s Museum of Art History), has turned into an almost 2 hours long marathon of questions. Some of the most prominent international artists (like John Baldessari) and curators around the globe who addressed Ruscha & Weiner through the KHM Curator for modern and contemporary art Jasper Sharp, wanted to know everything from “what is their favourite letter” to “who is the most overrated dead artist”. The artist talk was organised in cooperation with VIENNAFAIR The New Contemporary. It was an entertaining evening with Ed Ruscha showing his funny side and Weiner admitting his love for certain substances, both of them enjoing the odd drop of whiskey during the talk. Ed Ruschas exhibition “And the ancients stole all our great ideas” will open in the KHM on the evening of 24th September. It is the first in the series of exhibitions with acclaimed international artists invited to work with museum’s collections. Gallery Hubert Winter is showing Lawrence Weiner’s solo exhibition Impeded time, open until November 3rd.